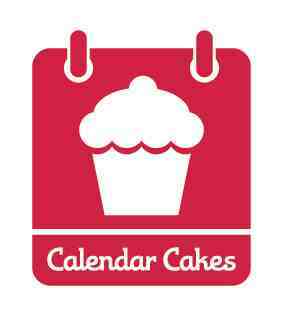 So to kick us off with the first Calendar Cakes of 2013 the theme is New Year, New You! After the excesses of Christmas most people's thoughts turn to a slightly healthier January. So whatever healthy or at least healthier treats you might be making this January we'd love you to join us in our Calendar Cakes Challenge. Maybe you've been considering making a cake or bake with unusual vegetables, a fruit cake or cake with fruit, a reduced sugar bake or a bake with substituted ingredients...if so then this is the challenge for you. I'll do a round up of all the entries at the end of January. What a way to top off 2012 than to start New Years Eve day in the snow and end it at the beach. We didn't plan it that way but it ended up to be so, which made it a pretty cool day! They always say California is the only place you can snowboard and surf in the same day. 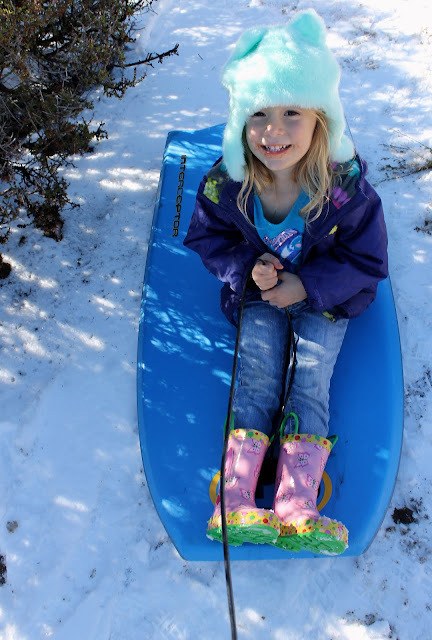 Well we did it 3 year old style: not quite snowboarding and not quite surfing, but it was fun all the same. Mount Laguna here we come. Our destination was stopped a bit short due to road conditions, but that didn't stop these snow seekers from finding a some suitable snowy patches. 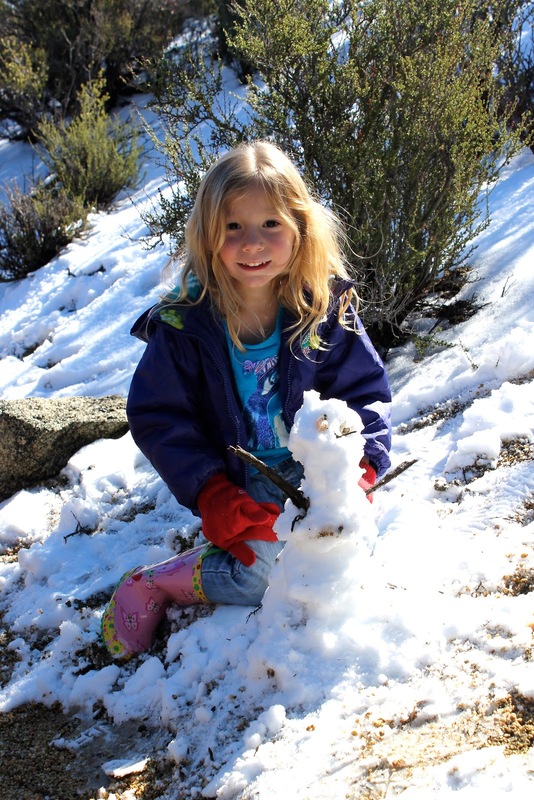 Ellie was very proud of her little snow man. 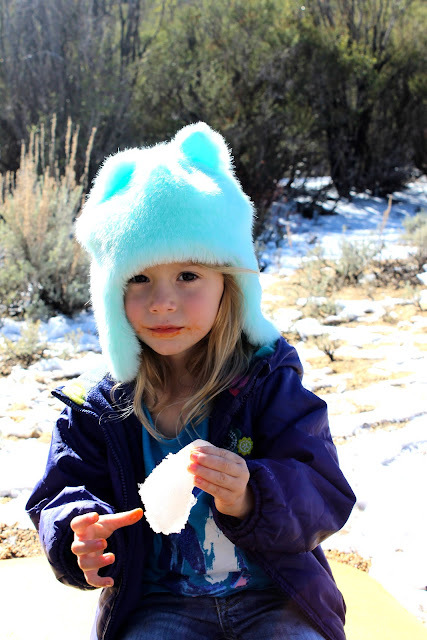 and she loves to eat the snow.. just not the yellow snow. 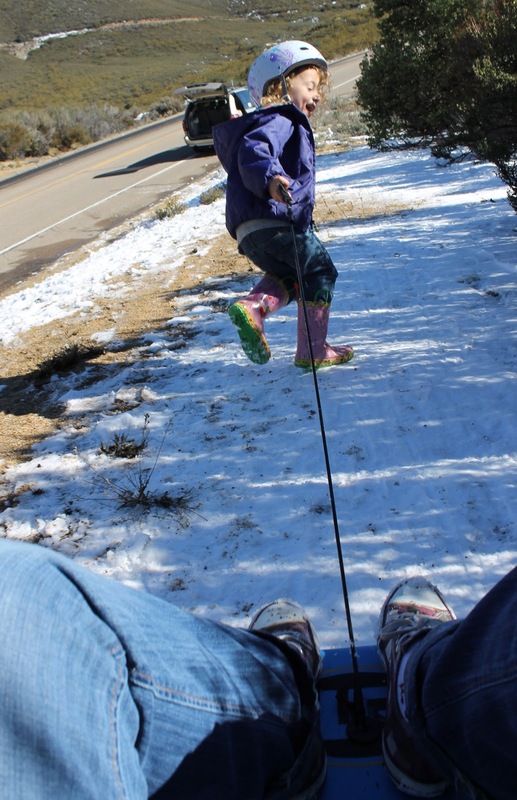 Lola was all about the sledding, she even sported her bike helmet. Lola wanted to give me a ride too! Ocean Beach here we come! So after spending and a few hours up in the snow we headed back west on highway 8. 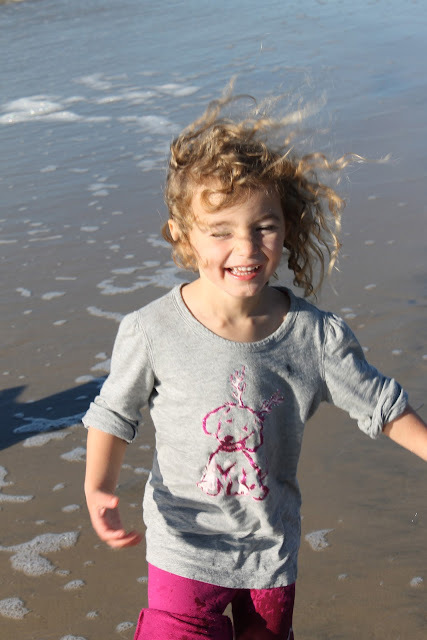 Tony joked and said, "Wouldn't it be cool just to take the 8 all the to the beach, so our toes can touch the snow and sand in the same afternoon," I said "why not"... and drove straight into Ocean Beach. 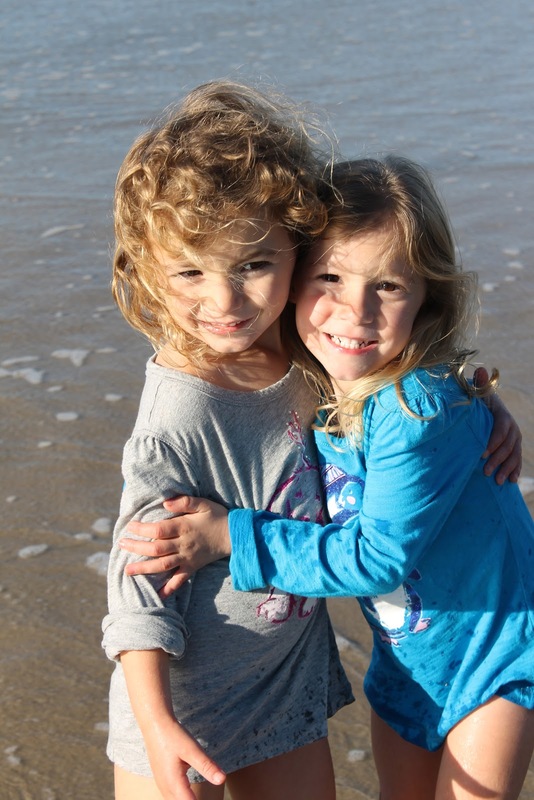 Man did this turn of events make these little ladies pretty happy, they thought they were headed home for naps. Their smiles say it all! Can I just say I love the beach in the winter almost as much as I do in the summer. Then home to officially bring in the New Year (the New York new year at 9:00 PST of course)! HAPPY NEW YEAR TO ALL! 2013 is looking good so far! We woke up this morning to snow on the ground and huge, wet flakes falling. It was obvious that the perfect way to spend the last morning of the year was to go outside and play. So we did! 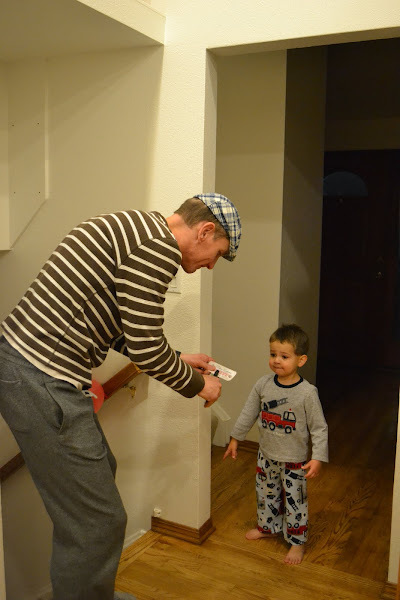 one of our recent family fun night was Polar Express themed. 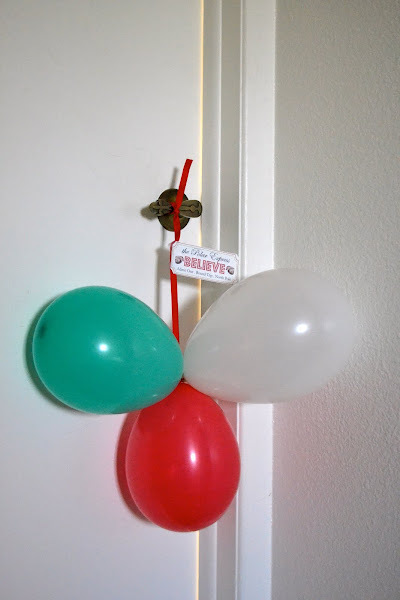 i tied these balloons to the kids doors while they were resting. 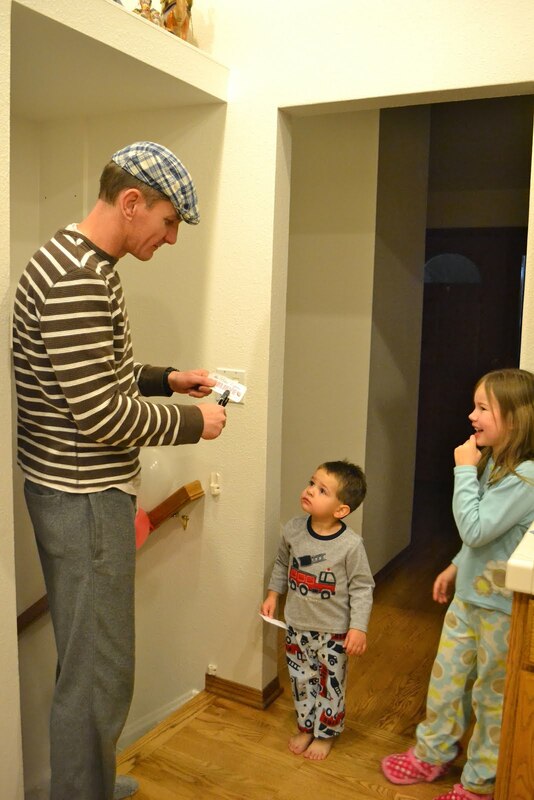 it was their ticket to our Polar Express night. i found the printable tickets here. i made red & green popcorn for a snack. i found that easy idea here. i put the popcorn in these cute bags i made. 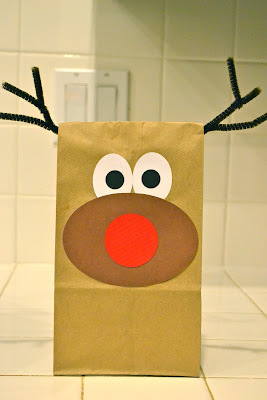 i used card stock and pipe cleaners to decorate the brown lunch bags. we set up the family room with a hot cocoa station, cookies and popcorn. we blew our train whistle and the kids came running down the stairs, ready to have their tickets punched. we enjoyed the movie and the yummy treats! 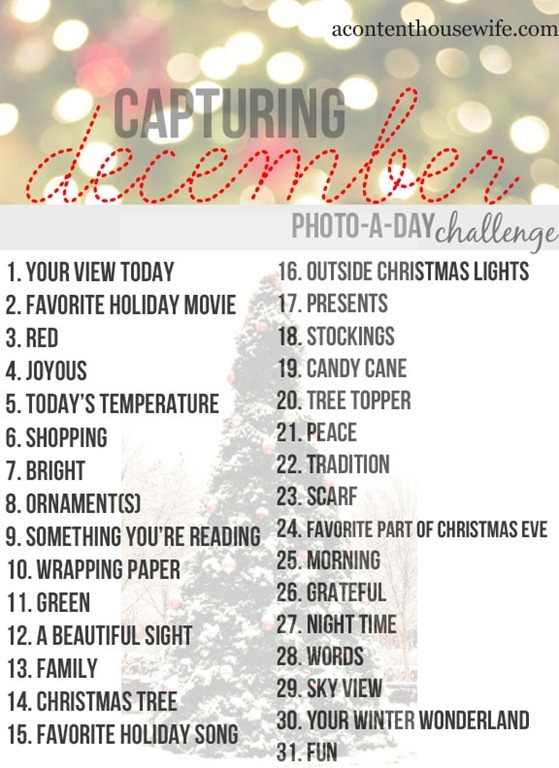 this post wraps up the photo-a-day challenge that i began back on December 1st. it was a lot of fun! Katherine plays almost entirely with boys at school. She likes most of her female classmates, and they like her, but she has no patience with their girl drama. I can totally relate to that. I played with boys all through grade school and hung out with boys all through high school for pretty much the same reasons. Katherine came home one day a month or so ago and announced "Chloe says she likes Chance. I mean likes likes him. Ewww! That is just NOT appropriate!" I gave a big sigh of relief, glad that she runs with a different crowd. Most of the boys Kate hangs out with are my former students. They are sweet, smart kids, a little squirrely, but well-meaning. None of them are destined to be great athletes or voted Most Popular. They talk about legos and computer games and spinning top-like toys called beyblades. They are 3rd grade geeks. And they have accepted my girl as one of their own. When I see them at recess, huddled together giggling, it always makes me smile. One of the leaders of this self-named Lego Club is a boy named Trent. He's a skinny kid with freckles and prominent ears - adorable in a Howdy Doody sort of way. Katherine talks about Trent more than any of the other boys. He makes her laugh. She's been to his house and they have long conversations about dirt bikes and dogs and what a chore cleaning your room is. He's her buddy and she likes hanging out with him. I helped with Katherine's classroom Christmas party last week. When I entered the room, Kate's teacher pulled be aside and whispered, "Katherine has an admirer. He gave her quite a nice gift today." Then she gave me a knowing look and pointed to a gift bag on Katherine's desk. I walked over and greeted Kate. I casually asked about the present on her desk. "Oh, that" said Katherine. "Trent gave it to me. It's an owl." And it was. A darling, nerdy owl. A great gift for my darling, nerdy girl. Trent's desk was beside Katherine's. He was gazing at her in a dreamy, moon-eyed way. "Yeah, I knew she'd like it," he grinned. It was clear that Trent likes Katherine as more than one of the guys. As in likes likes her. Thankfully, Katherine is totally oblivious. I am not sure how I feel about this turn of events in the 3rd grade social scene. Part of me is highly amused that this goofy kid is in love with my daughter. It's cute. And funny. Part of me is horrified that a boy is in love with my daughter. My 8 year old! Part of me is relieved, and very grateful, that Katherine has good friends and does not seem to be a social outcast, as I was at her age. 3rd grade is complicated, even for the parents. I have many concerns about the social life of my girl, but for now, there are no solutions or answers. Will other kids tease her about Trent and his crush? How will her happy, safe place in the Lego Club change when the other boys start to see her as more than one of the guys? How will she handle that? Will there be a place for her in the strict hierarchy of girls? How and when will her classmates hurt her? For now, I'll keep Katherine supplied with legos, listen to her recess tales, and hope for the best. I will not say a single word about Trent. Or his owl. I am so proud of her for finding her own place, making her own way, even if it's different from the other girls. She is strong, stronger than I realize. And I have to remember that. Our girls are so lucky- their Christmas seemed to never end. Our friends Monte and Kathleen came over to give the girls their Christmas surprise. Here they are waiting patiently in their Christmas dresses they kept on all day after wearing them to church. So fun, the girls are very excited! They actually tried these out this night in their dresses and all. They were able to ride like pros! Lola, Kathleen, Ellie, and Monte. We celebrated Christmas with Uncle MarK, Auntie Missi, Liam, and Aiden the day after Christmas. These four munchkins always have so much fun together. We had planned to fix a nice dinner, but the day got filled up so we feasted on Indian food take out - Yumm ! After the feast we opened some more gifts. The girls got the best game ever, UNO for 3-5 year olds. We all had so much fun playing it together. Time for the cousins to hit the hay and the parents to watch a movie... Too cute.